Festival season has officially begun in Austin. Everyone is scrambling to find their perfect instagram-worthy ACL outfit, looking for interesting pieces that can withstand the heat while turning some heads. Fanny packs, glitter, and sunglasses are all staples during Austin City Limits, but an endless creativity also appears at the festival. The looks found within Zilker Park during those first weekends of October come in many different styles. From mismatched patterns paired with fun sunnies to layering colors underneath a simple skirt overall, ACL fashion has no limits. Here are some looks that can inspire festival goers with outfits that can combat the heat and embrace creativity. 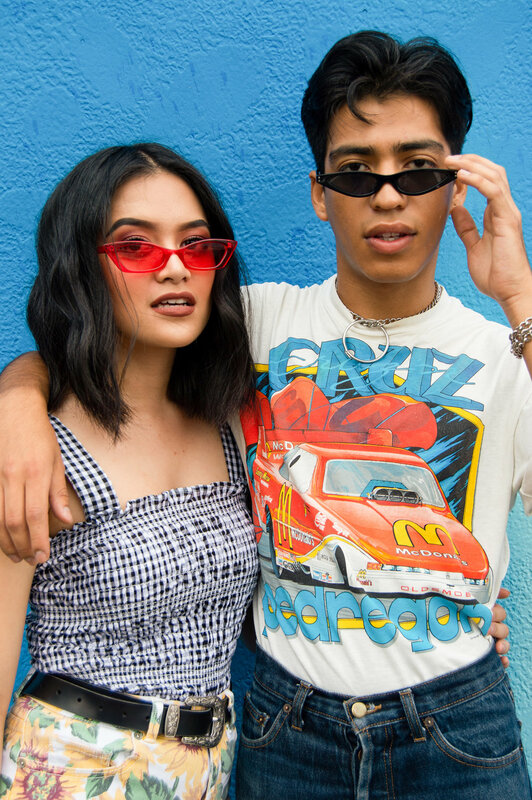 Zoe Judilla and Cruz Rendon in their festival fits. Rendon wears a thrifted shirt, jeans from American Apparel, shoes from Zara and sunglasses from Urban Outfitters. Judilla wears shorts from Pac Sun, a top from Urban Outfiters, Doc Martens and thrifted sunglasses. Raquel Guerra sports a playful, vibrant look. Guerra pairs overalls with classic converse. Isabella Casey wears a skirt from Paris, a top from Urban Outfitters and a bag and shoes from Marshall’s.